China, a country of ancient civilization, is the birthplace of many dazzling arts and crafts, and Chinese handicraft articles found their way into overseas markets as an important medium of exchange with other countries. 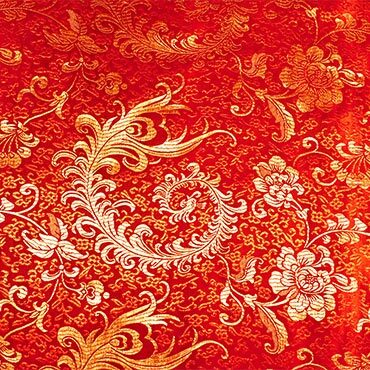 Chinese silk, following a route known later as the Silk Road, reached the distant Roman Empire along the coast of the Mediterranean in the Han(206BC-AD220) and Tang(168-907) dynasties, and China enjoyed fame as the Land of Silk in the East. Silk carpet making was not a Chinese tradition, but it was born of wool weaving of nomadic tribes. While rugs were being woven in China two thousand years ago, there was not a real industry until the mid-eighteenth century. Chinese rugs differ radically from their main Islamic counterparts by using traditional Buddhist and Taoist motifs, and blue, apricot and yellow as their main colors. Before the 1987 embargo from Iran, Persian rugs from were the most famous and pricey carpets, due to their their beauty and high quality. During the embargo, copies of Persian rugs were made in other Asian and Middle Eastern countries. But because they were cut out of the U.S. trade, Iranian weavers have not kept up with U.S. fashion trends, and during the embargo, the quality of Iranian rugs declined, while weavers in China improved. Iran lost their focus after the embargo, and quality dropped dramatically. Iranians tend to be a little bit less perfectionist, where the Chinese are very perfectionist. Although fine rugs are made on machines, many people prefer handmade rugs because they embody culture and tradition. You can tell a machine-made rug because its fringe is attached after the rug is manufactured rather than being an integral part of the rug. You also can pull individual threads from the pile because a machine-made rug doesn't have knots. The number of knots in a rug can be a general indication of its quality. Knots show how much work went into making the rug. More knots mean more work. More knots also make possible a greater intricacy in the pattern. Assuming that an experienced weaver can work on 360 knots per hour, it takes 2 years to complete a 1000-knot per square inch silk Chinese rug with a 3' x 5' size. For this reason, our items are priceless, and should be cherished as extremely valuable items. A well-made silk rug is durable. That means that if you make a wise choice when shopping for a Chinese silk rug, you can count on having it for a very long time.